of his years as Janis Joplin's road manager. John Byrne Cooke experienced the 1960s within the music of the counterculture. In the folk-music boom of the early '60s, John was a member of the Cambridge, Massachusetts, bluegrass band, the Charles River Valley Boys, whose musical home was the legendary Club 47. Joan Baez and Bob Dylan were among his friends and contemporaries. John recorded two albums with the CRVB and played music from Cambridge to Berkeley and Big Sur. When rock and roll displaced folk music, John was in the right place at the right time. He was a member of D.A. Pennebaker's film crew at the Monterey Pop Festival in June 1967, where Janis and Jimi Hendrix became overnight sensations. When Albert Grossman signed on a few months later to manage Janis and her band, Big Brother and the Holding Company, he hired John to road manage them. John is the only person who traveled with all three of Janis's bands, from 1967 until her untimely death in 1970. "Most most most important you get Janis right and I can feel her and she is alive when I read your book. It is truly an impressive, masterful and heartfelt piece of work." "You wrote the best book about Janis. The second best book about Janis, and I don't know what that would be, is not even close to yours...This is quite an achievement, John. Bravo." "I just finished reading this engrossing book and really loved it." "Cooke has a unique perspective...painting a picture that covers the full spectrum of Joplin's personality as an artist and a person...His own story...gives a weight to his writing that makes this work poignant and important...the most thorough exploration written about Joplin's life." "Cooke's memoir...is sharp when it comes to dissecting Joplin's progress as a musician." "Joplin emerges as someone we all might like to have known...Cooke is good on the politics of the music business and the decisions that might not have been in her best interests." "Cooke provides an intimate, affectionate look back at his time with Janis in his newest book...Cooke's book is a valuable insight into the performer as a living, breathing person, with her own -all-too-human strengths and vulnerabilities. The author may be one of the few people left in the world with that kind of perspective on her, so it's a good thing that he is a gifted writer, letting Joplin's vivaciousness and intensity shine throughout the work." "I am a fellow writer and musician, but that's not important. The publication of Mr. Cooke's memoir of working with Janis Joplin, however, is a significant addition to the history of popular culture in the late 1960's. I have read everything available regarding Ms. Joplin and felt--erroneously--there was little remaining to be said. 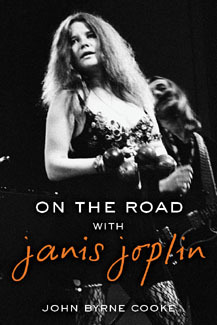 On the Road with Janis Joplin not only provides innumerable missing pieces in the puzzle that was Janis, it is also one of the best written memoirs of her era that I have ever come across." 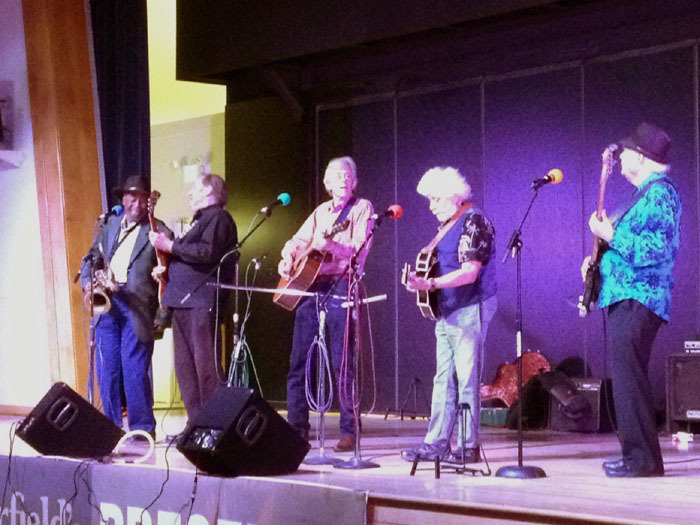 John Byrne Cooke at the Center for the Arts, Sebastopol, California, on November 1, 2014, with (from left) Snooky Flowers, of the Kozmic Blues Band; Sam Andrew, of Big Brother and the Holding Company; JBC; Banana, of the Youngbloods, Grandpa Banana's Band; Peter Albin of Big Brother. 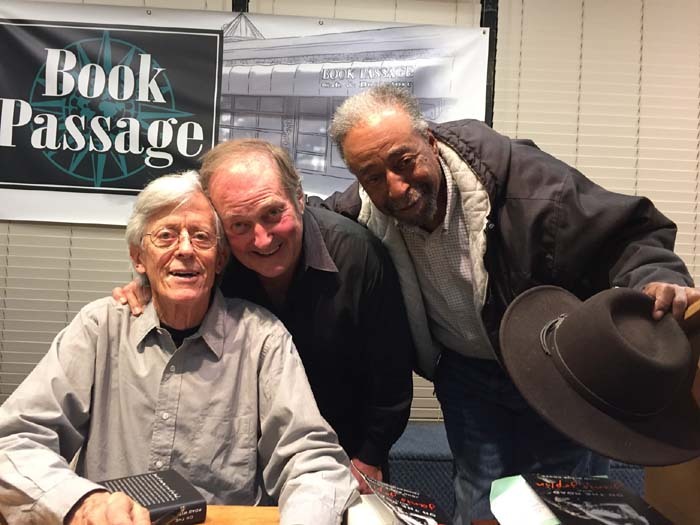 John Byrne Cooke at Book Passage bookstore, Corte Madera, California, on November 2, 2014, with Sam Andrew of Big Brother, and Snooky Flowers of Kozmic Blues. 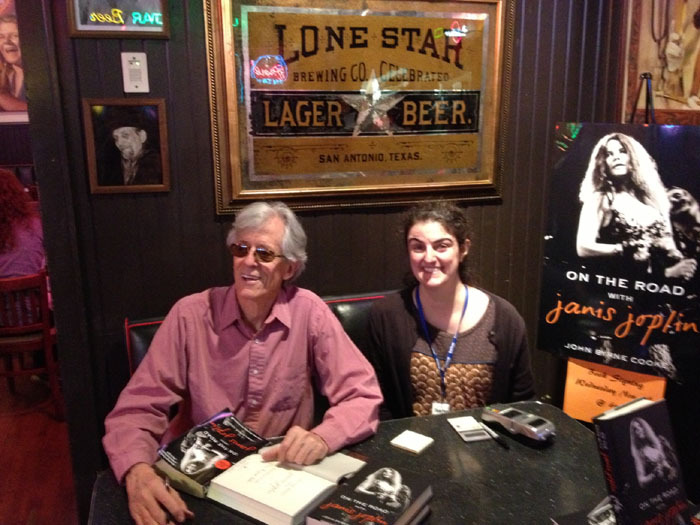 John Byrne Cooke signing books at Threadgill's, Austin, Texas, on November 5, 2014, with bookstore rep Mo of Book People. From Chapter 1. "If You're Goin' to San Francisco"
A couple of years ago I moved to California for what I thought would be forever, but it turned out I was chasing the wrong girl. This time, I'm here to stay. I'm a rock and roll recruit, a visitor to the Summer of Love who has returned as an immigrant. I have left behind the life of a performing musician in the interest of getting serious about the rest of my life. For now, I will help others devote themselves more fully to their music while I handle the money and logistics. I have exchanged my guitar for a attaché case. It contains itineraries, contracts, and the promise of loud music, late nights, and loose women. To Peter Albin, I reveal none of the giddy high that the waters of the bay, the sight of Coit Tower, a glimpse of the Golden Gate Bridge, arouse in me. With Peter, I'm all business. . . . Right now, I've got to pass inspection by the immigration officers of the rock community, my prospective employers, Big Brother and the Holding Company. . . . They rehearse in a loft in a building they call "the warehouse," close by an off-ramp where the Central Freeway dumps traffic into the city streets. When Peter and I enter the loft, the four other members of the band are sitting at a round oak table by the windows. There's a bed covered with a patterned spread from Madras, the ubiquitous, versatile fabric by which a generation of bohemian youth is enriching the textile magnates of India. There are amps and instruments and a drum set off to one side, random sticks of furniture, and enough floor space to hold a dance competition. A few oil paintings adorn the walls. They're by the drummer, David Getz, I will learn. David has set his painting aside for a venture into rock and roll. The space could be any number of artists' lofts where I've been to late-night parties in New York, but, except for the paintings, the art in progress here isn't visible, and the quintet scrutinizing me now is pure San Francisco. This is the moment of truth. The truth is, I'm nervous, which is a condition I customarily conceal beneath a reserved exterior. I recognize Janis, of course, but Peter is a polite fellow and he introduces her first. It was Janis who took the audience's breath away at Monterey, this Texas white girl who belts the rocking blues like no one else, propelled by one of the founding bands of the San Francisco Sound. Sam Andrew and James Gurley are the lanky guitar players, sprawled in their chairs with legs askew. Tight-fitting black jeans. Pointy-toed boots. Long hair. Way longer than any east-coast beatnik's. Theirs is down past their shoulders, combed straight like Janis's. I'm six-feet-one-and-a-bit, and I judge that Sam and James, upright, will inhabit the same altitude. Peter is a couple of inches shorter. David is more compact. He falls into the range that eyewitnesses describe as average height. At this meeting he sits squarely on his chair, all his attention on me, just as he sits at his drums onstage, centered and balanced. Who is this guy from New York, and how can he possibly understand who we are? David is from New York himself, so he withholds judgment. Peter's hair, and David's, is a little shorter than Sam's and James's, pageboy haircuts gone to seed. Janis is watchful. In repose her face is unremarkable, not what you'd call pretty. Only her eyes betray the vitality she releases in performance. They are clear and alert, and when the introductions are over it is Janis who speaks first. "That sounds just," James says. This is a generous reaction and I'm grateful to him, but Janis is looking me up and down with all the distrust appropriate for greeting a newcomer from the East, a road manager imposed on the band by Albert Grossman, the personal manager they barely know and for sure don't fully trust. Janis shrugs. "I don't care much about Libras one way or the other." But I'm cool. I take no offense, because they accept me. Cautiously and with reservations, to be sure, but they accept me. I'm a rock-and-roll road manager. When I got off the plane it was only make-believe. From Chapter 3, "It Happened in Monterey"
The performance many of us will remember forever comes from Big Brother and the Holding Company. They take the stage on Saturday afternoon, four long-haired guys and Janis Joplin. Their outfits aren't as flamboyant or coordinated as the styles of the L.A. acts. Sam and James are in black jeans and boots and loose-fitting shirts. Peter and David venture more color. Janis wears hippie street clothes, jeans and a top. In San Francisco she's already something of a local legend. She has been singing with Big Brother for just a year, and she has won a reputation as a singer like no other. Beyond the Bay, she is all but unknown. The short set culminates with Janis's show-stopper from the San Francisco ballrooms, Willie Mae "Big Mama" Thornton's "Ball and Chain," which Big Brother has recast in a minor key, the better to evoke the emotion in the lyrics. Their arrangement begins with four ascending notes wrenched from James Gurley's guitar, a momentary Handelian silence, and an intro that shatters all the rules. James plays riffs from an alternative reality, and chords that no one at the Gibson guitar factory ever dreamed. His overture is a wail from another point of view, an assault on the festival's self-satisfied bliss, and it transfixes the audience. Up to now, Big Brother is just another variation on the San Francisco Sound. From this moment, they're Something Else. Sittin' down by my window, Just lookin' out at the rain . . .
She doesn't stay in the soft register for long. Her voice rises, pleads, screams. By the time she hits the first chorus, the audience is mesmerized. Can a white girl sing the blues? Janis's answer is yes, in spades. She matches the intensity of James's guitar while she explores the same outer realms, and . . . she can't . . . but she does. . . . When she really pulls out all the stops she sings chords! In the second row of the audience, in the fenced-off section reserved for performers and VIPs, Mama Cass Elliott gapes open-mouthed. When the audience's roar of approval erupts at the end of the song, Cass turns to the guy beside her and exclaims "Wow. Wow! That's really heavy!" Backstage, Big Brother is jubilant—but there is trouble brewing, right here in Music City. Big Brother, along with some of the other San Francisco bands, refused permission to be filmed, and Pennebaker is beside himself. Big Brother has to be in the movie! Janis's performance will make the movie! The Grateful Dead have also declined to be filmed. So have Moby Grape, but the Bay Area ranks are disunited. Country Joe and the Fish gave permission. So did the Airplane. Julius Karpen, Big Brother's manager, is adamantly against their appearing in the movie. Karpen is a balding, myopic, beatnik businessman who drives a hearse. He is called Green Julius within the San Francisco rock scene because he smokes prodigious amounts of weed. By the account of one insider, Julius refuses to discuss business with anyone who won't first smoke grass with him. He is given to waxing philosophic, and at length, about the state of the world and the unique role of the San Francisco scene in the larger swirl of the cosmos. Like many another eccentric, Julius has found a home in the San Francisco counterculture. He is deeply suspicious of the world at large and the music business in particular. The movie is a rip-off, he says. Everybody's playing for free, so why should Phillips and Adler and ABC-TV and whoever else profit from the performances, while the bands get nothing? Oh, right, proceeds to causes that benefit popular music, whatever that means. Janis is sympathetic to the anti-commercial ethic that pervades the San Francisco music scene. She is devoted to the communal spirit that the bands share, but nothing is more important to her than Big Brother's career. Maybe the fact that the Airplane—the only other San Francisco Band that features a chick singer—has agreed to be filmed has something to do with Janis's determination that Big Brother should be in the movie too. She leads the fight against Julius and a couple of the boys back her. At an impasse among themselves and at odds with their manager, the band casts about for an oracle to show them the auspicious pathway. They turn to Albert Grossman.